This is a great beginner run for all watercraft. At higher water flows the run gets pushier and more exciting. Even though the river looks tame, swimmers should be aware of strong currents. Always wear your lifejacket on this stretch of river. Many commercial outfits run portions of this section. A lot of people put in at Rocky Rapid and float to take out beach. You can make the run from hittle bottom to take out beach in a day easily (even at low water). The scenery is outstanding on this section. No permit is needed for private trips on the Moab Daily. This can be used as a put-in or take-out if you want to shorten or lengthen your Moab daily run. If you are taking out here you will have to pull left on rocky rapid to get into the left channel. This is another possible access point. There is no ramp but you can access the river from Highway 128 here. Not a bad option for kayakers. Especially if take out beach is crowded with commercial trips. Where Highway 191 crosses the Colorado river there is a boat ramp to the east on the north side of the river bridge. If you are near the bridge you will be able to see and figure out how to get to the ramp. This rapid occurs where the Onion Creek drainage enters the colorado river from the south. Run right of center. 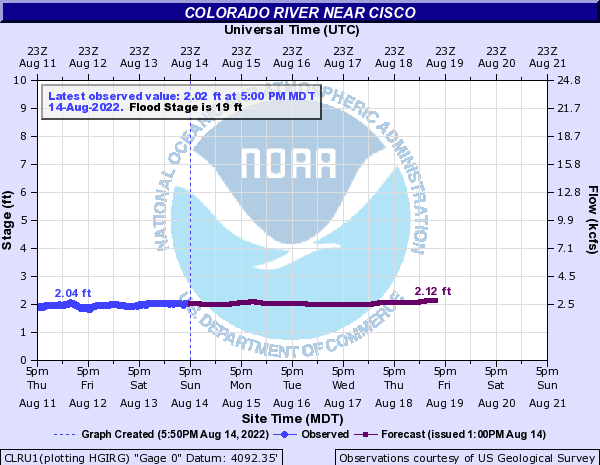 Arguable the biggest rapid on this stretch of the Colorado, and certainly flippable at larger flows above 25,000cfs. Follow the wave train to the left of river center for the bigger water. Frequent, strong eddy at conclusion of rapid on river left, especially at large flow levels. Rocky start to rapid at lower levels around 5,000cfs. Distinct horizon at start of rapid so may need to stand beforehand to scout your line.